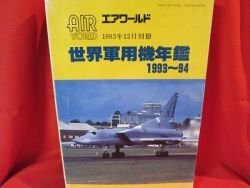 Title :'Air World Extra' Military Aircraft Of The World air force encyclopedia book 1993 - 1994 Language : Japanese. This is an official book. Release Date :1993 Total Pages : 320 pages Condition : USED. Very Good. No missing page. Description:This encyclopedia is to enjoy Military Aircraft all over the world. Details of about military aircraft that operated from 1993 to 1994 havebeen described. If you love Air Force don't miss it!